Like the movie character that it represents, Optimus Prime (Lot #1325.1) is big. An entire team of artists and illustrators worked tirelessly, drawing potential trucks and cars, trying to zero in on just the right look for each robot/vehicle. When the film’s production designer showed Michael Bay a photo of the enormous tractor trailer, the director was immediately taken by the lines and size of the truck. Specs include a custom bumper, “headache rack,” dark tinted windows, ominous, glowing blue lights and the trucks two most important and well known features: the blue and red flamed paint job and “Autobots®” badge mounted prominently to the grille shell. 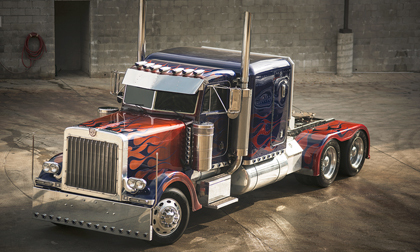 Optimus Prime is a fully functioning vehicle with a real VIN and a title in Paramount Pictures’ name. Bumblebee is a1967 Chevrolet Camaro SS (Lot #1325.2) that was featured in the latest Transformers movie, “Age of Extinction.”Owned by American filmmaker Michael Bay, this Resto-Mod features custom suspension, an LS2 Corvette engine with overdrive transmission, and Wilwood brakes with added stunt caliper. The exterior is finished in satin black paint with high-gloss yellow accents and custom carbon-fiber fender flares and air dam. The car was also included in a March 2015 Architectural Digest feature of Bay’s cinematic Los Angeles home. For more information on becoming a bidder, follow the link to www.barrett-jackson.com/bid. Enjoy the 45th Anniversary Scottsdale Auction in style with a Barrett-Jackson VIP Experience Package. Information on available packages and how to be a part of this world-class event is available here.